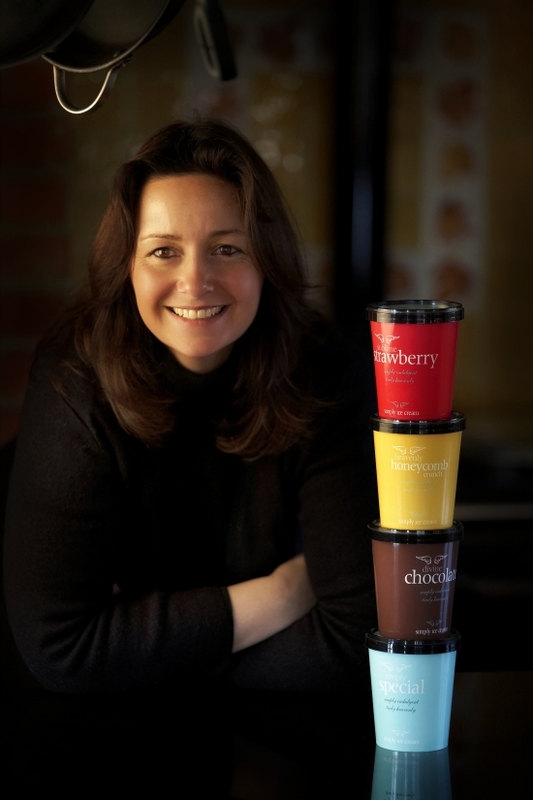 There are so many challenges to running a manufacturing business, let alone doing it from home, with a young family and in a very seasonally affected market but that’s just what Sally Newall, owner and founder of Simply Ice Cream, has done to great effect. “I was a chef initially, running a successful catering business and we were putting on hundreds of events over the year. Every weekend was packed with weddings and functions and the weeks were filled will all the planning, preparation and cooking. One of our show-stopping desserts included a recipe for honeycomb ice cream, it was so popular guests were asking to buy the ice cream and clients were requesting it time and again. On the back of these requests an idea formed that we might have a product we could sell into retail so we approached a local farmshop who agreed to trial it for us. 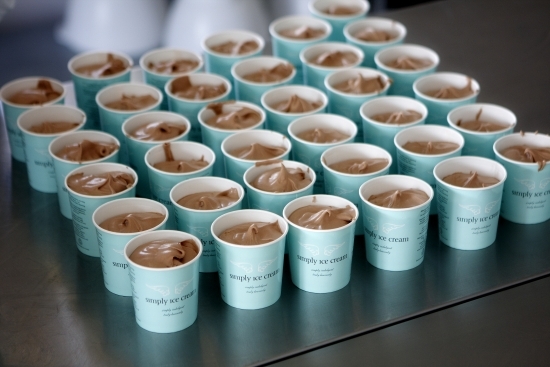 We made up a few pots and the money from that first retail sale went into starting Simply Ice Cream. That was in October 2005, we’re now available nationally in over 500 outlets including Waitrose, Ocado and Co-op stores. “We were lucky to be able to self-fund from the outset. It’s not that I wouldn’t use investors it’s just that we haven’t needed to so far. All our profits have been reinvested into the business and I’m very careful to save money for those unexpected events in case one of the delivery drivers crashes a van or a freezer breaks down. My advice to anyone starting their own business from scratch would be that if you can stick to your day job at the same time and work without those hours, then it’s worth your while. You may not have much of a social life initially but it massively reduces your risk and gives you a good idea of whether your business is going to work or not. “We have invested around £100k into the business over the past year or two. As an artisan ice cream we don’t really need lots of fancy production equipment to make the product range as so much of it is done by hand but we do need quality freezer storage and frozen delivery vehicles so this is an area in which we frequently invest. “One of the best things I ever did to help grow Simply Ice Cream was to stop trying to do everything myself. I know my skills lie in the culinary side of the business, I do all my own new flavour innovations and research and so far it’s worked. It is so easy when you are passionate about your product to get bogged down in the day to day detail but investing in a business mentor has helped me to take a step back and work ‘on the business rather than in it’. I would advise any small business owner to play to your own strengths; no one has the time to do it all, so I also use consultants to help me with other aspects including PR, marketing, accounting and efficiencies. “Manufacturing is such a complex industry as there are so many moving parts from NPD, to production, to storage and delivery. But our greatest outlay is our staff, as our range is still produced by hand in small batches from my home in Kent. Getting the HR right from the outset is absolutely imperative to a successful business, make sure you have clearly defined contracts in place and every staff member has a clear job description and knows their responsibilities. We made a few mistakes in the early days which were costly but now, with help and advice from my business mentor, I have restructured the workforce, set down the processes and procedures in a dedicated operations manual which has really helped to refocus the workforce and ensure we are all pulling in the same direction. “We have an annex building attached to my family’s home where the ice cream is produced every day using only natural and (where possible) locally sourced ingredients. We try to only use local and British businesses after we learnt in the early days how complicated it can be if you don’t. We were just getting the company going and I had tasked a printing company to produce our new luxury paper pots who then outsourced it to a company in Italy. When the 50k pots came back the printing was all completely out of register (too fuzzy to read), it was a disaster as we were getting the product ready for our first Waitrose order. After a bit of a battle and a few flights to and from Europe we got our money back in the end, since then we have made a pledge to use only British companies with premises we can visit in case we need to iron anything out. “One of the biggest challenges for a manufacturing business is holding stock, especially frozen stock so we tend to make-to-order as much as possible. We can anticipate orders to a certain extent and we never make lots of stock just to hold it. In fact, we will actively reduce production if we are having a quiet period. But the ice cream market is as fickle as the British weather and we have to be as ready for a heatwave as we are for a rainy August. We have a set system of procedures and extra shifts we can put in place to cope with these fluctuations in demand. “Continuing to grow at this same rate is always going to be a challenge. Brexit brings many mixed emotions and is having an impact on costs but we are optimistically hoping that buyers are going to look to UK businesses more in 2017. The biggest challenge will be managing the increase in costs now. Everyone raced out after the Brexit decision and bulk bought supplies but these are now coming to an end so we are going to see a steady increase in costs over the next few months.